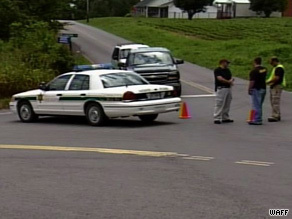 (CNN) -- "A gruesome scene" is how one investigator described the aftermath of five killings in Tennessee. A sixth body was found in Alabama. Police gather outside one of the scenes of mutliple slayings in Fayetteville, Tennessee, on Saturday. Kristin Helm of the Tennessee Bureau of Investigation told CNN on Saturday that authorities have Jacob Shafer in custody in connection with the deaths. She added that authorities are not looking for additional suspects. Huntsville, Alabama, Police Sgt. Mickey Allen said Tennessee authorities told him a man confessed to a slaying in Huntsville, Alabama, and to five other killings in Fayetteville, Tennessee. Allen didn't identify the man. Shafer has been questioned by the TBI and is expected to face murder charges, Helm said. Sheriff Murray Blackwelder, who held an afternoon news conference, called the slayings "one of the worst crimes Lincoln County has ever seen." He didn't describe how the Lincoln County, Tennessee, victims died. Dr. Bruce Levy, medical examiner for Tennessee, was working to identify the bodies found in that state, Helm said. Fayetteville police responded to a call to South Lincoln Road about 10 a.m. (11 a.m. ET), Blackwelder said. Police found three crime scenes and five bodies on that street, he said. The five victims, some of whom were related, were found in two homes, Helm said. Investigators think the killings occurred either Friday night or early Saturday, she said. The sixth body was found at a business in Huntsville, Sheriff Allen said. He said he is unsure of the connection between the crime scenes in Tennessee and Alabama. Huntsville is about 30 miles from Fayetteville. "We have no clue yet as to what unfolded there and how it relates to here," Allen said. CNN's Mayra Cuevas-Nazario contributed to this report.